i had two amazing surprises today. i was running late for my meeting with seattle pastry chef dana cree when i quickly parked in front of the ice cream store to discover -- oh my gosh! there's a lot of blank space between the world and the ice cream shop! 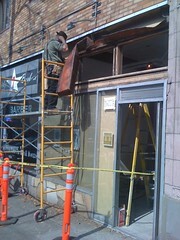 this morning the guys from dovetail (my fantastic contractors) tore down the ugly1960s cover-up job of the original clearstory windows above the storefront. it's beautiful! 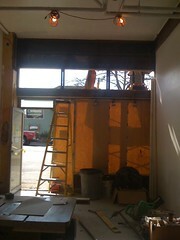 the three windows let in so much light and bring a more classic look to the interior of the space, too. but i had to run. i was late for my meeting with dana. i walked into fuel coffee to find her ordering from my fave fuel barista, noah. i was so happy to find through our meeting that dana cree is fabulous. i'd heard great things about her. she's the pastry chef at veil on queen anne. but she is SUCH a knowledgeable chef willing to share her wealth of information -- exactly what i needed! dana will be making all of the toppings for molly moon's homemade ice cream including hot fudge, caramel, butterscotch, and seasonal fruit compotes. yum! she's also going to help me perfect the balsamic ribbon for balsamic strawberry ice cream, teach me how to take full advantage of whole vanilla beans, and help me with the creation of baracky road! molly moon hearts dana cree.